Another option available, rather than dig up the old pipes, is a process called trenchless pipe bursting and involves slip lining the old underground drainage pipes. Pipe bursting is a trenchless method of replacing buried sewer pipelines without the need for a traditional construction trench. 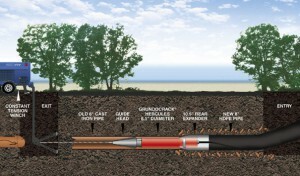 "Launching and receiving pits" replace the trench needed by conventional pipe-laying. Pipe bursting may also be used to expand pipeline carrying capacity by replacing smaller pipes with larger ones, or "upsizing."